"KGB Archiver is a file archiver and data compression open source utility as well as compression tool with unbelievable high compression rate. Version 2 beta 2 is available for Microsoft Windows and a command line version of KGB Archiver 1.0 is available for Unix-like operating systems. 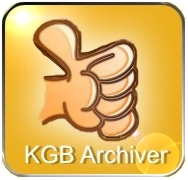 KGB Archiver is one of the few applications that works with the PAQ algorithm for making its KGB files. One of the advantages of KGB Archiver is also AES-256 encryption which is used to encrypt the archives"
An Explorer shell extension is available for the windows versions.